Hello Squirrel-friends! Are you sitting down? You need to be sitting down. I have some news for you! Are you aware that there are only 39 days until Christmas???? THIRTY-NINE!!! WTH?!?! We were just at the beach! And now here we are trying to decipher this madness that is a Christmas list! There are three papers shown below- THEY ALL BELONG TO ONE LITTLE!!!! The list has been growing for awhile. I guess I should be happy that he makes it a little easier for us because there is no question as to what he wants. He knows exactly what he wants to open! He even puts like things together. I mean, how considerate is that?? And over all the mommy years, one of the hardest things can be telling other family members what your child wants for Christmas! With a list like this, I can send only portions of it to family out of state. I can take pictures of part of it to send to family that we will be with over the holiday. And I can ensure there aren't any duplicate purchases!! It just makes it so much easier when they have a list. (Unless they have the handwriting of Littlest Little- good gravy)! As you are reading through this, pay close attention to #7. "7. New Books (jk lol Who Reads?)" Are you getting the enormity of this list??? It is like he has kept it by his bedside and added to it everytime he has seen a commercial for something that he might like. Ok, it appears that he does, in fact, keep this list by his bedside and adds to it when he sees a commercial for things he might like. Either way, it is efficient and he is a front runner for getting the things he wants! Not because we have deemed him our favorite- that would be wrong! You don't have favorites (well you're not supposed to). We love all of our children equally. 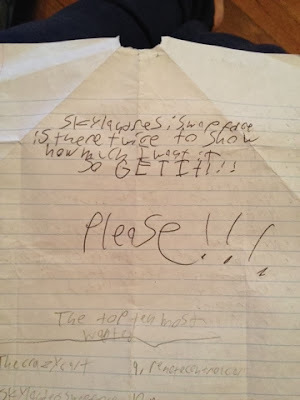 He even references that Skylanders Swapforce appears on the list more than once "to show how much he wants it"
Look at his use of punctuation and how he visually gets his point across by writing in all caps. This child has a plan. If I have taught my Littles anything (other than apparent greed), I have taught them that how other people feel is very important. And that you should always take that into consideration when you are communicating with others. So he may have seen that this was a tad overwhelming. He knows I "get it", but what about Dad, the Grandmas, the Aunt Tillys (we don't have an Aunt Tilly, but it ended that sentence nicely). 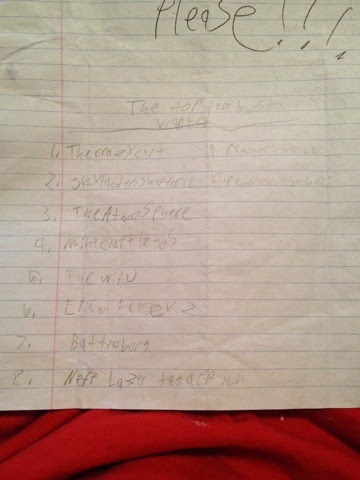 He predicted their frustrations- so to make it EVEN EASIER- he referenced the BIG list on this much smaller, abridged TOP TEN MOST WANTED list. Thank goodness! Because now we can strategically (as parents) purchase items from the TOP TEN MOST WANTED list and earn major points as the BEST GIFT GIVERS EVER!!!! So many benefits to the list. I have pictures of it on my phone (along with a notepad list on the app) and when The Mr. and I are out we make notes of prices and packaging/bundle deals. 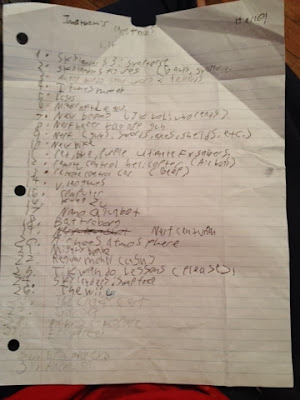 The actual "list" itself is "not allowed to leave the house" per the author. Who could blame him? This is his "Treasure Island"! There are awards to be won for such a list!! It will all come together (before our 39 days are up). It always does. Even if the older two only mumble possible gifts as they mope past us in the hall. Every once in awhile we hear a "oh, that's cool" during a commercial and we have to make a mental note to add it to the notepad later. I believe that next year, we are going to farm out listing responsibilities to lil Mr Steinbeck. He will be in charge of grilling the other two, making observations, and recording them. We will of course compensate him for his duties by ensuring that items from the TOP TEN MOST WANTED list are covered first:) This could be a very lucrative endeavor, indeed. What was on your list when you were nine? I had to think back- way back. And I had to google search some pictures because I don't have quick access to pics from my childhood Christmases. 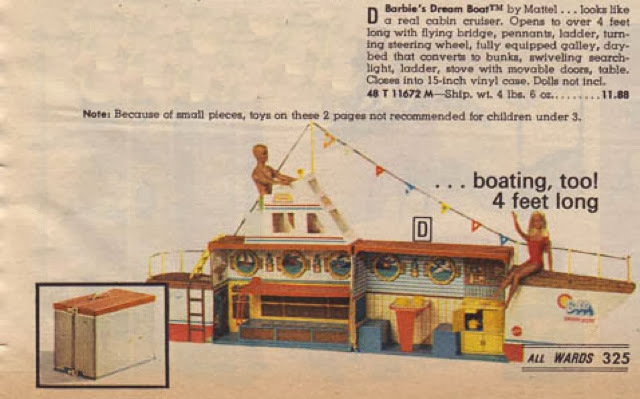 I searched for the Barbie Dream Boat that I loved so much that has been in a landfill now for the last 30 years and lo and behold I found these! I have to be honest and say that I don't actually remember if it was my gift or my sisters? But I do remember hours and hours and hours of playing with it. And how I would have Barbie stand at the sink and wash those tiny little yellow dishes and put them away in the cabinet below!!!! Either Barbie or I had a lil touch of OCD. 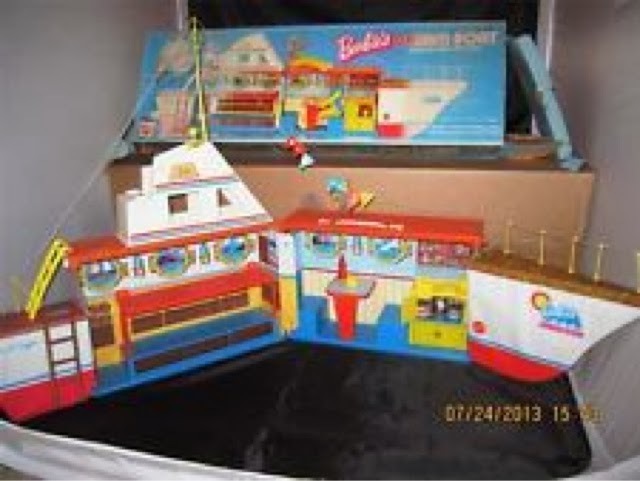 And I remember being so upset because the dishes were never straight like they were when I took the boat out again!!! (I think it was Ken). It was $11.99 in this catalog?!?!?!? Whew, inflation!! Barbie can't rent a shoe box under the bed for that anymore!!! 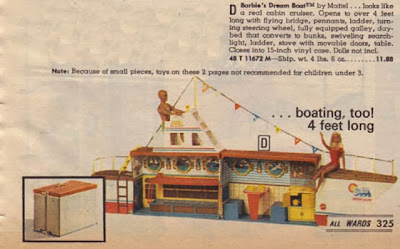 What was the one thing that you remember as your favorite gift from a Christmas list when you were young? Tell us and leave a link to a picture if you can! And then get on the ball people because you only have THIRTY-NINE days left!!! Love the list! We do lists too. Makes shopping a lot easier. One of my favourite gifts ever was a Barbie Dream House. I had it in storage up until a couple years ago. It was so wide and we had to purge when we renovated. So this Christmas my 6 year old has Barbie Dream House on her list!!!! And it's all thanks to the ads on t.v. I wanted an easy bake oven. My mom bought me a cookbook and let me use the real oven instead. Thus my start in baking, it has served me well over the years.